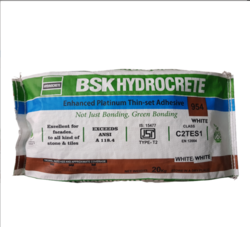 Offering you a complete choice of products which include polyurethane tile adhesive. Owing to our ISO 9001:2008 certification, we are considered as the foremost manufacturer and supplier of Polyurethane Tile Adhesive. The offered adhesive is specially formulated for use in wet areas such as kitchen and bathroom. It is processed under the strict vigilance of our deft professionals using superior-quality chemicals.